The Global Volcanism Program has no activity reports for Rucharuyama [Golets-Tornyi Group]. The Global Volcanism Program has no Weekly Reports available for Rucharuyama [Golets-Tornyi Group]. The Global Volcanism Program has no Bulletin Reports available for Rucharuyama [Golets-Tornyi Group]. Rucharuyama, with the small pyroclastic cones of Golets and Tornyi, is SW of Moyorodake (Medvezhia) volcano at one of the narrowest parts of Iturup Island, and formed during the late Pleistocene or early Holocene. A small lava flow from the 417-m-high Tornyi cone occupies a broad glacial cirque. The 442-m-high andesitic-dacitic Golets cone, constructed above the eroded remnants of the Pleistocene Parusnaya Mountain volcano, produced lava flows that reached the coast. The Global Volcanism Program is not aware of any Holocene eruptions from Rucharuyama [Golets-Tornyi Group]. If this volcano has had large eruptions (VEI >= 4) prior to 10,000 years ago, information might be found on the Rucharuyama [Golets-Tornyi Group] page in the LaMEVE (Large Magnitude Explosive Volcanic Eruptions) database, a part of the Volcano Global Risk Identification and Analysis Project (VOGRIPA). There is no Deformation History data available for Rucharuyama [Golets-Tornyi Group]. There is no Emissions History data available for Rucharuyama [Golets-Tornyi Group]. 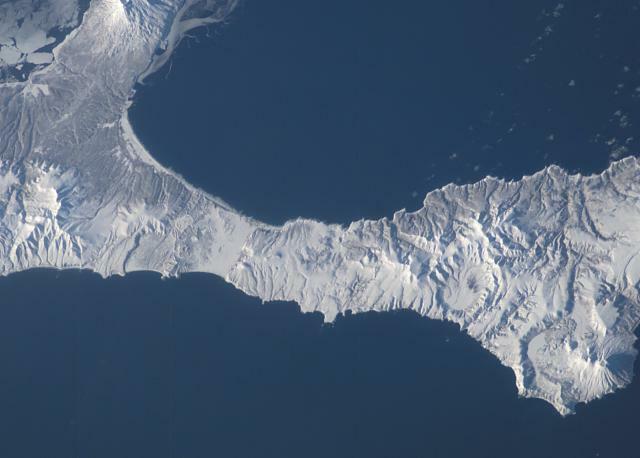 The small pyroclastic cones of Golets and Tornyi are located near the center of the narrow Vetrovoi Isthmus in northern Iturup Island. At the upper left in this NASA Space Shuttle image (with north to the upper right) is Chirip volcano; at the lower right is Medvezhia volcano. The flat-floored caldera to the left of Medvezhia caldera is the Pleistocene Tsirk caldera. Golets and Tornyi pyroclastic cones formed during the late Pleistocene or early Holocene east (right) of the low-lying graben forming the narrow point of the peninsula. NASA Space Shuttle image ISS010-E-13393, 2005 (http://eol.jsc.nasa.gov/). There are no samples for Rucharuyama [Golets-Tornyi Group] in the Smithsonian's NMNH Department of Mineral Sciences Rock and Ore collection. Large Eruptions of Rucharuyama [Golets-Tornyi Group] Information about large Quaternary eruptions (VEI >= 4) is cataloged in the Large Magnitude Explosive Volcanic Eruptions (LaMEVE) database of the Volcano Global Risk Identification and Analysis Project (VOGRIPA).